The challenge of working in the private sector in an industry that was both unknown and very fascinating to me. My current position allows me to utilize my nearly four decades of know-how in law and politics. As head of integrity and law I have the opportunity to build on the company’s common rules and values. 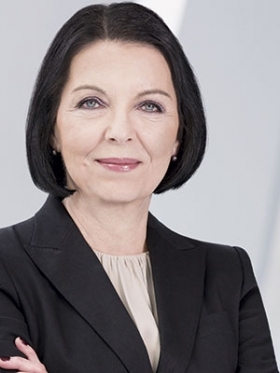 I joined Daimler in 2011 in the newly created board of management position of head of Integrity and Legal Affairs. That is definitely what I am facing right now at VW Group in the newly created role of head of integrity and law. I joined at a time when the company was going through the most difficult phase in its history. Now the goal is to make sure that acting with integrity is the basis for any and all dealings at every level of the company. We work to make sure that everyone, from the board, to management as well as every single employee upholds our existing rules and standards. What has driven you during your career? I have the need to constantly discover something new. At the same time, I have the desire to improve things that aren’t great and turn them into something good. What should be done to encourage women to enter the auto industry? We have to earnestly search for good women to join the automotive sector. They are out there. I love getting together with my children, visiting with friends, relaxing and attending cultural events. The quest to find the right answers to the most important questions. Name one thing about yourself that most people don’t know. I can actually be unreasonable. However, that’s all I’ll share of my inner workings. It would be Willy Brandt, one of the most outstanding German statesmen of the 20th century. He worked decisively to spread peace and democracy throughout Europe and contributed so much to create a unified Europe. Repeat everything that has happened in my life, even the mistakes. I would love to be able to take things less to heart. Find yourself and be yourself. The same as above. However, I would also add that it is important to build on your strengths, recognize your weaknesses and know that everyone has weaknesses. I don’t want to be a car. However, I want to drive one that is beautiful, dynamic and safe.